Carrots, a perfect winter-themed vegetable are one of the December ingredients on this site that our writers are working on incorporating into their recipes. 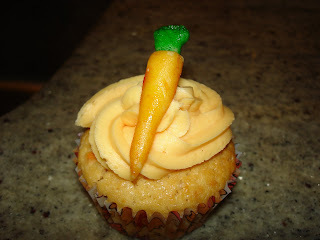 I wanted to include carrots in my next cupcake recipe, while mixing up some tropical flavors. So, I decided to create a recipe for carrot papaya cupcakes, and wound up throwing in some coconut, which mixed nicely with the other flavors. I enjoyed decorating these cupcakes as well. This time, I made a pretty matching buttercream, dyed to the perfect shade of peachy orange. I created miniature carrots out of marzipan to decorate each cupcake and used an unused watercolor brush (I like to do a lot of painting - acrylic, watercolor and oil)to paint the carrots using water-based food coloring. More complex marzipan (and fondant) painting projects, which I plan to do in the future, will require investing in some professional food colorings, which I plan to purchase at my local store that sells cooking and baking equipment when I go out tomorrow. This will be perfect for upcoming projects including fondant-marshmallow Santa peeps and dreidel/Christmas tree cookies with Royal icing. At any rate, these cupcakes really are not difficult to make, so don't be intimidated by the photos. It is worth giving a try at home, even if you have never worked with marzipan before. If you cannot find fresh papaya to make your puree, (it's not exactly in season but you should still be able to get it, since it's not like papayas are ever grown in New York anyhow) you can substitute mango or pineapple. I discovered that I only had organic baby carrots, which are quite difficult to grate with a peeler, unsurprisingly. To make the mix, combine the flour, coconut, baking powder and salt in one bowl. In a second bowl, combine the carrots, papaya puree, milk, sugar and melted butter. Combine all ingredients and fill your cupcake trays 2/4 to the top. I suggest using silicon cupcake trays with paper liners. This recipe should make about a dozen cupcakes. I baked the cupcakes at an oven preheated to 350 F for about 28 minutes (took a little longer than I thought it would). You should test them with a toothpick or fork to make sure they are done on the inside. 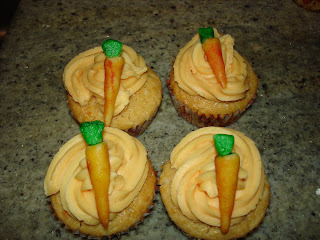 While the cupcakes were baking, I molded little carrots with a top out of marzipan. I used a 50-50 mix of several drops of food coloring with several drops of water (slightly diluted) to create orange and green colors. I painted the carrots with a watercolor brush (one that had never been used in painting with watercolors!) I plan on experimenting in the future with more professional grade food colorings, but for this project, the grocery store standard food coloring did the trick. After taking the cupcakes out of the oven they should be allowed to cool for at least 30 minutes. If you frost too soon, the frosting will melt on the cupcakes. For my frosting, I decided to do a plain buttercream, which is the most common type of cupcake frosting. It is also exactly what the name implies - butter and sugar, and lots of both. So let's not confuse these cupcakes with anything too healthy just because I made them with fresh fruits and veggies. They are quite tasty and a great treat to serve at a party. First, beat the butter in an artisan stand mixer. You really cannot make buttercream without a stand mixer. Some people can do this using a hand mixer, but I never could because 1) I could not beat the butter to the right consistency and 2) food flies everywhere and it makes a colossal mess in the kitchen (literally - butter on the walls). You should beat the butter well on a high speed. Then add the three cups of confectioners sugar, which is loose powdered sugar. Don't press it in the cups, but keep it light and airy when measuring. Beat the two together until they form a frosting and keep beating beyond that for a minute or two at a high speed. It will take a couple minutes for the two to mix properly, as in the beginning it just looks like you added too much sugar. Then beat in the vanilla and add a few drops of food coloring. I chose to add three drops of yellow and 1 drop of red to make an orange colored buttercream. To decorate the cupcakes, frost with a frosting bag fitted with either a plain or fluted tip, which will allow the cupcakes to have a really professional look to them. It's actually very easy to do and the frosting bags are inexpensive and surprisingly painless to clean when you are done. 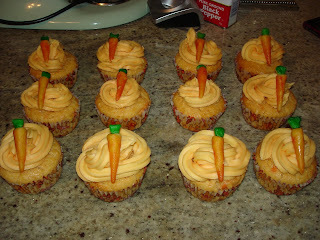 Top with the marzipan carrot and enjoy! Next up: apple sorbet with poached quince shortcakes, so stay tuned. Akitcheninbrooklyn.com is doing a roundtable on carrots for the month of December. For additional carrot recipes, click here for Amasea's carroty latkes or here for Amasea's sweet gingery carrots.